Page Rehabilitation and Healthcare Center implemented the NV200 and NV400 units in selected areas. 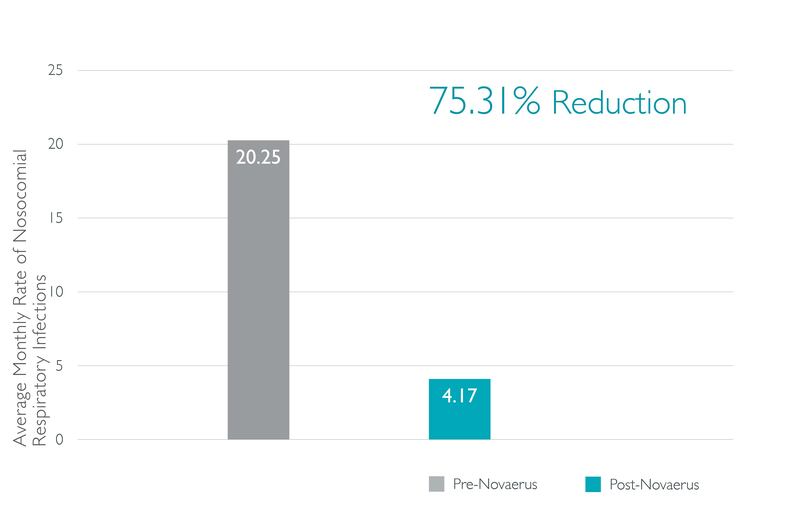 This study compares the average monthly rate of nosocomial respiratory infections before and after implementation of the Novaerus technology. A 29-month review was conducted to evaluate the results of implementation. In a prior review that was completed by RB Health Partners, Inc. on December 3, 2013, the average monthly rate of nosocomial respiratory infections was 20.25 before Novaerus implementation. This prior study also observed that the averagemonthly rate of nosocomial respiratory infections decreased to 5.00 in the same four-month period after Novaerus implementation. This study compares the average monthly rate of nosocomial respiratory infections before and after the 29-month period of implementation of the Novaerus technology. In the 29-month period after implementation of the NV200 and NV400 in selected areas, the average monthly rate of nosocomial respiratory infections at PRHC decreased from 20.25 to 4.17, a 75.31% reduction.